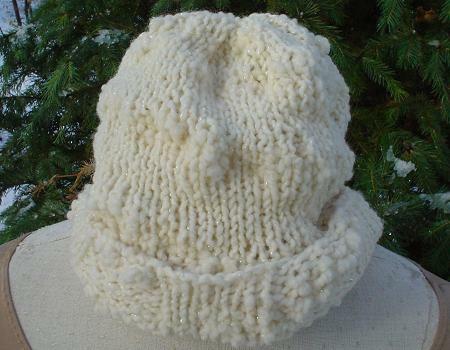 A textured hat knit in the round. Created by the Daily Knitter staff. Cast On 50 stitches. Join to work in the round, being careful not to twist stitches. Place marker on needle to indicate beginning of round. Round 1: (K5, P5) around. Repeat Row 1 until piece is 4 Â½”. Now knit every round (Stockinette Stitch) and work until piece is 9″ total. Round 1: (K4, K2tog) around until last 2 stitches, K2. Round 3: (K3, K2tog) around until last 2 stitches, K2. Round 5: (K2, K2tog) around until last 2 stitches, K2. Round 7: (K1, K2tog) ) around until last 2 stitches, K2. Cut yarn leaving an 6″ tail. With the yarn needle, thread the tail through the remaining loops on the needle and pull tightly until the hat top is closed. Thread the leftover yarn tail through the hat to the inside and secure.